That being said, Dalio did post a piece a couple days ago on LinkedIn that scratches the political itch that we all seem to have these days. It’s called “Reflections on the Trump Presidency, One Month after the Election”; and given the level of connections that Bridgewater management has and their often outside-the-box views, as well as the fact that this piece from Ray is a relatively positive one that seems appropriate before Christmas, I offer it up as this week’s Outside the Box. Dalio makes the point “This will not just be a shift in government policy, but also a shift in how government policy is pursued.” I am just back from a dinner meeting with a number of people in Washington who have some insight into the process, and I think I have to agree with that assessment. The interesting thing for us observers is going to be how a conservative House with seriously competing ideas as to how tax policy should be done works together with a Senate that has different views and with a Trump administration that has yet again different approaches. One thing I focused on here at the dinner was that there seems to be a consensus building in Congress to almost immediately repeal the Obamacare tax along with several other taxes and have that as one of the first bills on Trump’s desk. The reason for that move is that pretty much everyone agrees nothing will happen quickly, and it isn’t clear which taxes will be cut; but they want to do something to create stimulus as soon as possible, and then maybe even go back and change everything all over again next summer. These cuts will be ones that can be made quickly, and there were more than a few people in the room who are familiar with the congressional process and who think a final tax bill may not be out until later in the summer. And if you want some stimulus quickly, cutting taxes is a simple way to get it. That doesn’t mean the taxes won’t all get put back on in some form or another later on as they figure out what the overall tax picture wil l look like; but for now it makes sense to get a quick tax cut to everyone. Frankly, I hope they deal with the corporate tax quickly, as there seems to be some bipartisan consensus on that. That would be better than trying to cobble together one huge omnibus tax bill. The dinner was hosted by the Committee to Unleash Prosperity. In general, much of the room was more optimistic about the potential for GDP growth in the coming years than I am. And they were not as concerned about dealing with the growing total debt of the US, although they did acknowledge that there is a very large contingent of deficit hawks in the Congress and Senate who are going to have their say on the budget and taxes. Those competing concerns – lowering taxes and dealing with the deficit and total debt – leave me distinctly unsure about what will eventually come out of the sausage factory that will create the new tax laws. But I don’t think there will be a quick resolution of the issues. It is somewhat ironic that we did my final tax planning today for 2016, but we really have no idea about planning for 2017 other than to assume that taxes want go down – and we hope that they do! I would love to be pleasantly surprised by a quick resolution on taxes so that we could all get on with business. And for those of you who simply can’t get enough politics these days (which sometimes sadly includes even me – though hopefully I will recover soon), let me suggest a quick read from my friend former Speaker of the House Newt Gingrich. It’s a collection of his essays on this last election cycle, simply called Electing Trump. You can get it for $3.99 on Amazon, and it is available only on Kindle. It really is a quick read – you can probably knock it out in less than 2 hours. As I’ve mentioned before, Newt has graciously engaged me in discussions on a wide ranged of topics in the past year, and our conversations have of course drifted to the political. He was consistently telling me since the fourth quarter of 2015 that Trump had a real chance. And he would patiently explain how frustrated so much of America was. I saw the frustration, but my political experience didn’t let me see how it would translate into a Trump victory. Now, hindsight shows that Newt was 100% on target, and he actually kept a sort of running diary of his comments and interviews, which is how this book could appear so fast. As Newt often says to me, “Real change requires real change.” Halfway measures are not going to make anybody happy. That’s where the rubber meets the road, because what is a good change for some people can be very upsetting to others. We will just have to see what emerges from the major process of chang e we’re embarked upon. Of course Newt’s book is partisan. As my kids would say, duh. But the political change he covers is part and parcel of a greater change that is happening. We’re near the end of Neil Howe’s Fourth Turning. I am reading a book that is probably going to be the subject of at least two letters early next year. It’s called Men Without Work. There are 10 million working-age men in America who are not participating in the labor force, and that trend line has been moving inexorably from the lower left to the upper right for 50 years, through Republican and Democratic administrations, through recessions and boom times. It wasn’t slowed down by the Clinton/Gingrich welfare reforms. The Greeks and the French have greater labor force participation rates than we do. And when you couple this worrisome trend with all of the other societal changes that are developing because of the increasing use of technology in the business arena, those of us w ho are trying to project macroeconomic outcomes are going to have to start paying much more attention to what’s going on sociologically on the ground. Is Dalio right? Will we see a lift in animal spirits beyond the Trump rally that morphs into actual businesses investing money in the creation of jobs? And will those jobs positively impact Middle America? The economic world is no longer simply defined by supply and demand but is increasingly under the sway of larger social and geopolitical movements. Trying to get a handle on all this is most confusing for a simple analyst like me. There will be no letter from me this weekend, so let me wish you a Merry Christmas and a Happy New Year and holidays. And I want to thank you for the best gift of all, the gift of your attention and time. It is precious to me, and I continue to try to be worthy of it. Now, let’s have a great week and enjoy family and friends and a little good cheer. Now that we’re a month past the election and most of the cabinet posts have been filled, it is increasingly obvious that we are about to experience a profound, president-led ideological shift that will have a big impact on both the US and the world. This will not just be a shift in government policy, but also a shift in how government policy is pursued. Trump is a deal maker who negotiates hard, and doesn’t mind getting banged around or banging others around. Similarly, the people he chose are bold and hell-bent on playing hardball to make big changes happen in economics and in foreign policy (as well as other areas such as education, environmental policies, etc.). They also have different temperaments and different views that will have to be resolved. This particular shift by the Trump administration could have a much bigger impact on the US economy than one would calculate on the basis of changes in tax and spending policies alone because it could ignite animal spirits and attract productive capital. Regarding igniting animal spirits, if this administration can spark a virtuous cycle in which people can make money, the move out of cash (that pays them virtually nothing) to risk-on investments could be huge. Regarding attracting capital, Trump’s policies can also have a big impact because businessmen and investors move very quickly away from inhospitable environments to hospitable environments. Remember how quickly money left and came back to places like Spain and Argentina? A pro-business US with its rule of law, political stability, property rights protections, and (soon to be) favorable corporate taxes offers a uniquely attractive environment for those who make money and/or have money. These policies will also have shocking negative impacts on certain sectors. Regarding foreign policy, we should expect the Trump administration to be comparably aggressive. Notably, even before assuming the presidency, Trump is questioning the one-China policy which is a shocking move. Policies pertaining to Iran, Mexico, and most other countries will probably also be aggressive. The question is whether this administration will be a) aggressive and thoughtful or b) aggressive and reckless. The interactions between Trump, his heavy-weight advisors, and them with each other will likely determine the answer to this question. For example, on the foreign policy front, what Trump, Flynn, Tillerson, and Mattis (and others) are individually and collectively like will probably determine how much the new administration’s policies will be a) aggressive and thoughtful versus b) aggressive and reckless. We are pretty sure that it won’t take long to find out. In the next section we look at some of the new appointees via some statistics to characterize what they’re like. Most notably, many of the people entering the new administration have held serious responsibilities that required pragmatism and sound judgment, with a notable skew toward businessmen. We can get a rough sense of the experience of the new Trump administration by adding up the years major appointees have spent in relevant leadership positions. 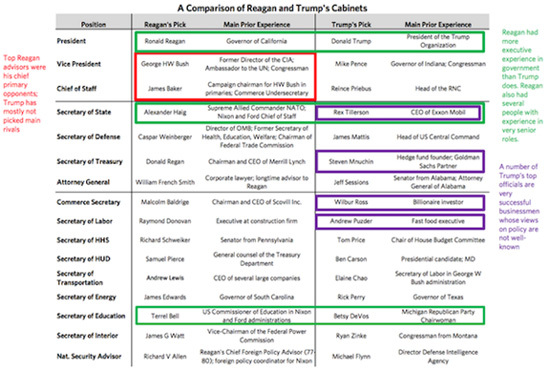 The table below compares the executive/government experience of the Trump administration’s top eight officials* to previous administrations, counting elected positions, government roles with major administrative responsibilities, or time as C-suite corporate executives or equivalent at mid-size or large companies. 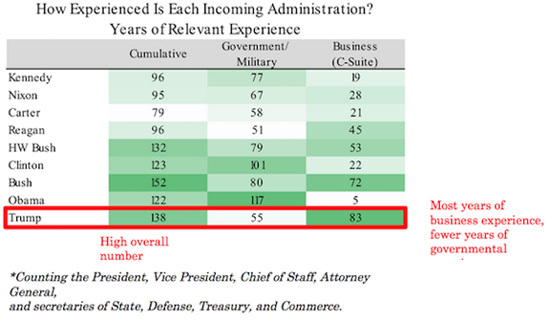 Trump’s administration stands out for having by far the most business experience and a bit lower than average government experience (lower compared to recent presidents, and in line with Carter and Reagan). But the cumulative years of executive/government experience of his appointees are second-highest. Obviously, this is a very simple, imprecise measure, and there will be gray zones in exactly how you classify people, but it is indicative. Below we show some rough quantitative measures of the ideological shift to the right we’re likely to see under Trump and the Republican Congress. First, we look at the economic ideology of the incoming US Congress. Trump’s views may differ in some important ways from the Congressional Republicans, but he’ll need Congressional support for many of his policies and he’s picking many of his nominees from the heart of the Republican Party. As the chart below shows, the Republican members of Congress have shifted significantly to the right on economic issues since Reagan; Democratic congressmen have shifted a bit to the left. The measure below is one-dimensional and not precise, but it captures the flavor of the shift. The measure was commissioned by a National Science Foundation grant and is meant to capture economic views with a focus on government intervention on the economy. They looked at each congressman’s vo ting record, compared it to a measure of what an archetypical liberal or conservative congressman would have done, and rated each member of Congress on a scale of -1 to 1 (with -1 corresponding to an archetypical liberal and +1 corresponding to an archetypical conservative). When we look more specifically at the ideology of Trump’s cabinet nominees, we see the same shift to the right on economic issues. Below we compare the ideology of Trump’s cabinet nominees to those of prior administrations using the same methodology as described above for the cabinet members who have been in the legislature. By this measure, Trump’s administration is the most conservative in recent American history, but only slightly more conservative than the average Republican congressman. Keep in mind that we are only including members of the new administration who have voting records (which is a very small group of people so far). While the Trump administration appears very right-leaning by the measures above, it’s worth keeping in mind that Trump’s stated ideology differs from traditional Republicans in a number of ways, most notably on issues related to free trade and protectionism. In addition, a number of key members of his team—such as Steven Mnuchin, Rex Tillerson, and Wilbur Ross—don’t have voting records and may not subscribe to the same brand of conservatism as many Republican congressmen. There’s a degree of difference in ideology and a level of uncertainty that these measures don’t convey. The above was a very rough quantitative look at Trump’s administration. To draw out some more nuances, below we zoom in on Trump’s particular appointees and compare them to those of the Reagan administration. Trump is still filling in his appointments, so the picture is still emerging and our observations are based on his key appointments so far. Looking closer, a few observations are worth noting. First, the overall quality of government experience in the Trump administration looks to be a bit less than Reagan’s, while the Trump team’s strong business experience stands out (in particular, the amount of business experience among top cabinet nominees). Even though Reagan’s administration had somewhat fewer years of government experience, the typical quality of that experience was somewhat higher, with more people who had served in senior government positions. Reagan himself had more political experience than Trump does, having served as the governor of California for eight years prior to taking office, and he also had people with significant past government experience in top posts (such as his VP, George HW Bush). By contrast, Trump’s appointees bring lots of high quality business leadership experience from roles that required pragmatism and judgment. Rex Tillerson’s time as head of a global oil company is a good example of high-level international business experience with clear relevance to his role as Secretary of State (to some extent reminiscent of Reagan’s second Secretary of State, George Shultz, who had a mix of past government experience and international business experience as the president of the construction firm Bechtel). Steven Mnuchin and Wilbur Ross have serious business credentials as well, not to mention Trump’s own experience. It’s also of note that Trump has leaned heavily on appointees with military experience to compensate for his lack of foreign policy experience (appointing three generals for Defense, National Security Advisor, and Homeland Security), while Reagan compensated for his weakness in that area with appointees from both military and civilian government backgrounds (Bush had been CIA head and UN ambassador, and Reagan’s first Secretary of State, Alexander Haig, was Supreme Allied Commander of NATO forces during the Cold War). Also, Trump has seemed less willing to make appointments from among his opponents than Reagan was (Reagan’s Chief of Staff had chaired opposing campaigns, and his Vice President had run against him). By and large, deal-maker businessmen will be running the government. Their boldness will almost certainly make the next four years incredibly interesting and will keep us all on our toes. IF 2016 was a year of shocks, what will the next 12 months bring? 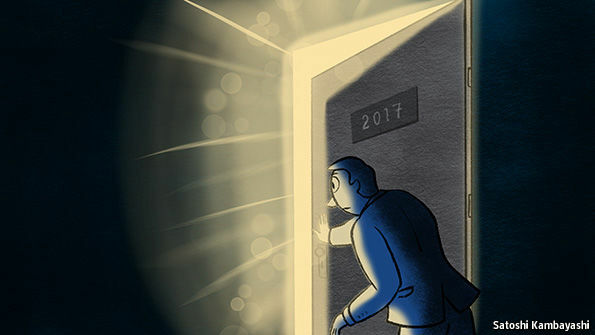 It is time for the annual tradition (dating all the way back to 2015) when this column tries to predict the surprises of the coming year. By definition, a surprise is something the consensus does not expect. A regular survey of global fund managers by Bank of America Merrill Lynch (BAML) points to what most people believe. Following the election of Donald Trump, investors are expecting above-trend economic growth, higher inflation and stronger profits. They have invested heavily in equities and have a much lower-than-normal exposure to bonds. So it is not too difficult to see how the first surprise might play out. Expectations for the effectiveness of Mr Trump’s fiscal policies are extraordinarily high. But it takes time for such policies to be implemented, and they may be diluted by Congress along the way (especially on public spending). Indeed, it may well be that demography and sluggish productivity make it very hard to push economic growth up to the 3-4% hoped for by the new administration. Neither fiscal nor monetary stimulus has done much to lift Japan out of its torpor, after all. American profits, which were falling in early 2016, seem certain to rebound, particularly if the new administration pushes through corporate-tax cuts. But with the market priced on a cyclically adjusted price-earnings ratio of 28.3, according to Robert Shiller of Yale, a lot of good news is priced in. The ratio, which averages profits over the past ten years, is 70% above its long-term average. Meanwhile, the Federal Reserve is pencilling in three rate increases in 2017, something that will probably push the greenback higher (and reduce the dollar value of foreign profits for American multinationals). So the surprise might be that Wall Street will not be that great a performer in 2017. By extension, the second surprise may be that government bonds do not do that badly. The yield on ten-year Treasury bonds is already approaching the top of the 1.5%-3% range in which it has been trading in recent years. Private-sector borrowing costs, including corporate bonds and fixed-rate mortgages, tend to move in line with Treasury yields. Increased borrowing costs would have an adverse effect on economic activity. As a result, sharp rises in bond yields are often self-correcting, since weaker economic data tend to drive yields back down. The third potential surprise of the year might be a dog that doesn’t bark. The biggest worry of the fund managers polled by BAML is that of EU disintegration. As a result they have a lower-than-normal holding in European shares. But the EU might get through the year unscathed if Marine Le Pen is defeated in France’s presidential vote and Angela Merkel is re-elected in Germany. Populism does not win every time, as the recent Austrian presidential poll demonstrated. Indeed, the euro-zone economies could grow at a respectable 1.6% next year, the OECD forecasts. The continent might even seem a safe haven, given events elsewhere. Another potential surprise in 2017 could come from a big market disruption. There have been a few of these events in the past—from flash crashes to sudden leaps in bond yields. They seem to be the result of computer programs that trigger sales when specific price points are reached and a retreat by banks from trading, which has made markets less liquid. The trillions that flow through financial markets every day are also a tempting target for cyberwarfare and cybercrime. The big story of 2017 could be an inexplicable (if temporary) crash in a vulnerable market, such as high-yielding corporate bonds. The final surprise may be served up by that most enigmatic of metals—gold. Working out a target price for gold is a mug’s game. You can understand why investors bought gold when central banks started expanding their balance-sheets after 2008. But it is harder to explain why the price more than doubled in less than three years before falling back since 2011. As investors’ inflation expectations have risen since the American elections, gold might have been expected to rally. Instead, it has fallen sharply—perhaps because investors see the metal as an inferior alternative to the surging dollar. But gold is not just a hedge against inflation, it is also sought out in periods of political risk. And with the Trump administration apparently poised to pursue a more aggressive approach towards China and Iran, it is hard to believe that gold won’t find a few moments to shine in 2017. Are the political upheavals of 2016 — Brexit and America’s election of Donald Trump — a triumph of democracy or a threat to it? Democracies must respond to legitimate grievances. Indeed, their ability to do so peacefully is among their strengths. But the demagogue’s exploitation of such grievances threatens democracy. This has happened elsewhere. It would be foolish to assume western democracies are immune. In 2016, fear and anger became dominant political emotions in the UK and the US — two of the most important, stable and enduring democracies. The fear was over downward mobility and cultural changes; the anger was against immigrants and indifferent elites. They came together in resurgent nationalism and xenophobia. Some Brexiters and Republicans believe in the ideal of absolutely free markets. But that idea did not bring Brexit to the UK or Mr Trump to Washington. The emotions were far more visceral and less attractive. For democrats, the outburst of such primal emotions is disturbing because they are so hard to contain. Democracy is at bottom a civilised form of civil war. It is a struggle for power contained by understandings and institutions. The understandings are that winners never take all. Opposition is legitimate, opinion free and power curbed. The values of the citizenry are a democracy’s most important asset. They must understand in their bones that it is illegitimate to make temporary power permanent by rigging elections, suppressing contrary opinions or harassing the opposition. There exists no such thing as “the people”; this is an imaginary entity. There are merely citizens whose choices not only may, but surely will, change. While a way must be found to aggregate those views, it will always be defective. Ultimately, democracy, or a democratic republic, provides a way for people with different views and even cultures to live side by side in reasonable harmony. Yet institutions matter, too, because they set the rules of the game. Institutions may also fail. The US electoral college has failed doubly. Its selection of Mr Trump neither accords with the votes cast in the election nor reflects judgment of the candidate’s merits, as desired by Alexander Hamilton. This founding father argued that the college would both guard against “the desire in foreign powers to gain an improper ascendant in our councils” and ensure “the office of President will never fall to the lot of any man who is not in an eminent degree endowed with the requisite qualifications”. The charges of Russian hacking and Mr Trump’s evident defects of experience, judgment and character show that the college has not proved the bulwark Mr Hamilton hoped for. It is up to other institutions — notably, Congress, courts and media — and the citizens at large now to do so. The more powerful the passions and the more uncontained the ambitions, the more likely the democratic system will collapse into despotism. Demagogues are the Achilles heel of democracy. There is even is a standard demagogic playbook. Demagogues, whether of left or right, present themselves as representatives of the common people against elites and unworthy outsiders; make a visceral connection with followers as charismatic leaders; manipulate that connection for their own advancement, frequently by lying egregiously; and threaten established rules of conduct and constraining institutions as enemies of the popular will that they embody. Mr Trump is almost a textbook demagogue. Nigel Farage, former leader of the UK Independence party, has not advanced so far because it has proved harder to capture the UK’s party-based institutions than it is the US presidency. Yet there are similarities between the demagogic elements of the Brexit campaign and the rise of Mr Trump. For both, opponents are enemies rather than fellow citizens who think differently. Both claim to represent the people against foreigners and traitors. The demagogue’s campaign leads naturally to despotism — the tyranny of the majority that is a mask on the tyranny of one. As institutions are brought under dictatorial control, the opposition is driven into rebellion or acquiescence. Despots use the former as an excuse for repression and the latter to demand absolute obedience. A host of examples of the demagogic route to power exists, in both past and present. Benito Mussolini and Adolf Hitler are case studies of demagogues turned into despots. It is not hard to think of recent examples, from Hugo Chávez to Viktor Orban and Vladimir Putin. Might this be the path some of the most important western democracies are now on — above all the US, standard bearer of democracy in the 20th century? The answer is yes. It could happen even there. The core institutions of democracy do not protect themselves. They are protected by people who understand and cherish the values they embody. Politics must respond to the fear and rage that brought Mr Trump to power. But it must not surrender to them. They must not be an excuse to destroy the republic. The presidency, particularly if supported by Congress and the Supreme Court, as might happen, is powerful enough to do much damage at home. Virtually on his own, the president may also start devastating wars. A rightwing demagogue in charge of the world’s most influential repository of democratic values is a devastating fact. The question still to be answered is whether the world we have known will survive it. ATHENS – Since the summer of 2015, Greece has (mostly) dropped out of the news, but not because its economic condition has stabilized. A prison is not newsworthy as long as the inmates suffer quietly. It is only when they stage a rebellion, and the authorities crack down, that the satellite trucks appear. The last rebellion occurred in the first half of 2015, when Greek voters rejected piling new loans upon mountains of already-unsustainable debt, a move that would extend Greece’s bankruptcy into the future by pretending to have overcome it. And it was at this point that the European Union and the International Monetary Fund – with their “extend and pretend” approach in jeopardy – crushed the “Greek Spring” and forced yet another unpayable loan on a bankrupted country. So it was only a matter of time before the problem resurfaced. In the interim, the focus in Europe has shifted to Brexit, xenophobic right-wing populism in Austria and Germany, and Italy’s constitutional referendum, which brought down Matteo Renzi’s government. Soon, attention will shift again, this time to France’s crumbling political center. But, lest we forget, the inane management of Europe’s debt crisis began in Greece. A minor country in the grand scheme of things in Europe became a test case for a strategy that could be likened to rolling a snowball uphill. The resulting avalanches have been undermining the EU’s legitimacy ever since. The problem with Greece is that everyone is lying. The European Commission and the European Central Bank are lying when they claim that the Greek “program” can work as long as Greece’s government does as it is told. Germany is lying when it insists that Greece can recover without substantial debt relief through more austerity and structural reforms. The current Syriza government is lying when it insists that it has never consented to impossible fiscal targets. And, last but not least, the IMF is lying when its functionaries pretend that they are not responsible for imposing those targets on Greece. When so many lies – with so much political capital invested in their perpetuation – coalesce, disentangling them requires a swift coup, akin to Alexander cutting the Gordian knot. But who will wield the sword? Tragically, the problem is both obvious and extremely simple to solve. The Greek state became insolvent a year or so after the eruption of the 2008 global financial crisis. Against all logic, the European establishment, including successive Greek governments, and the IMF extended the largest loan in history to Greece on conditions that guaranteed a reduction in national income unseen since the Great Depression. To mask the absurdity of that decision, new loans – conditioned on more income-sapping austerity – were added. When one finds oneself in a hole, the simplest solution is to stop digging. Instead, Europe’s powers-that-be, the Greek government, and the IMF blame one another for driving Greece’s people into an abyss. Thomsen and Obstfeld are partly right. Greek Prime Minister Alexis Tsipras had no business agreeing to the crushing fiscal targets demanded by Germany and the EU when I was the finance minister. My successor’s claims that the government never accepted the targets are disingenuous. As he well knows, I resigned chiefly because in April 2015 Tsipras agreed to them behind my back. My former colleagues are shooting the messenger, the IMF in this case, for relaying the bad news that the targets they agreed to require even more austerity. It is also true that the IMF consistently, and correctly, criticized the targets. But what Thomsen neglects to mention is that, without his and IMF Managing Director Christine Lagarde’s personal connivance, the European Commission would not have been able to impose those targets. And I should know: I represented Greece in the meetings of the Eurogroup (comprising the eurozone countries’ finance ministers) where it happened. Thomsen seems to be aware of his responsibility to stop legitimizing the German-led asphyxiation of Greece’s economy. In a telephone conversation in March with Delia Velculescu, the IMF’s Greek mission chief, Thomsen explained what should happen if Germany insisted on crushing Greece by not granting debt relief. According to the transcript of the call (released by WikiLeaks), Thomsen thought European leaders would leave the issue until after the United Kingdom’s Brexit referendum. Velculescu responded that, “for the sake of the Greeks and everyone else, I would like it to happen sooner rather than later.” But it did not happen, because Thomsen and Lagarde never dared to put Merkel on the spot. Instead, the IMF continues to blame others while providing Germany with political cover to maintain its chokehold on Greece. But, as Velculescu astutely pointed out, the repercussions affect “everyone else.” The troubling developments in Italy, France, and even Germany are a direct consequence of the Greek debacle. But Greece is the immediate victim, and it is therefore the Greek government’s responsibility to cut the Gordian knot, by declaring a unilateral moratorium on all repayments until substantial debt restructuring and reasonable fiscal targets are agreed. Greece’s voters twice gave their leaders a mandate to do just that: once when they elected the Syriza government in January 2015, and again that July in a referendum. For the sake of Greece – and of Europe – the authorities need to call a spade a spade. Italy is on the verge of a massive banking crisis. You’ve probably heard that Italian banks are in serious trouble. They’re sitting on more than €360 billion worth of non-performing loans (NPL). These are loans where the borrower has stopped paying. According to Bloomberg, the NPL ratio for five of Italy’s biggest banks is more than double that of the average European bank. UniCredit, Italy’s biggest bank, is down more than 45%. Banco Popolare, another major Italian bank, is down 74%. Banca Monte dei Paschi di Siena, Italy’s third biggest bank (and the oldest surviving bank in the world), has plunged 87%. This is a serious red flag. After all, we’re talking about the cornerstones of Italy’s banking system. And, right now, these stocks are trading like a banking crisis is around the corner. A "bailout" is when a government injects money into its banking system to keep it from collapsing. If the term sounds familiar, it’s because the U.S. government bailed out several “too big to fail” banks during the 2008 financial crisis. The Italian government has asked parliament to authorise up to €20bn to prop up the country’s most fragile banks, as it prepares to mount a possible state rescue of Monte dei Paschi di Siena, its third-largest lender, by the end of the week. About 35% of its loans are non-performing. It has about five times as many bad loans as the average European bank. representatives of the bank said it had enough cash to last 11 months. The Italian government asked parliament this week to increase the public borrowing limit by as much as 20 billion euros to potentially backstop Monte Paschi and other lenders. The rescue package needs to be closer to 30 billion euros to solve Italy’s bad-debt crisis, according to Paola Sabbione, a Milan-based analyst at Deutsche Bank AG. That conclusion assumes UniCredit and some other lenders can raise about 20 billion euros through capital markets, asset sales and profit retention -- leaving the government to fill the rest of the 52-billion-euro hole. In other words, Bloomberg is saying the current bailout plan isn’t nearly big enough. But we don’t think a bigger bailout would make much of a difference. Italy will go into more than $20 billion in debt to prop up its banking system. That is not going to plug the hole of $400 billion and growing of bad loans. It will just kick the can down the road… and not for long. Soon they will need another bailout. Banca Monte dei Paschi has been bailed out twice already to no avail. Italy is one of the most indebted countries on the planet. It’s more than $2.4 trillion in debt, and its debt-to-GDP ratio is north of 130%. For comparison, the US debt-to-GDP ratio is 104%. GDP measures a country’s economic output, but that’s highly misleading. Mainstream economists count government spending as a positive when calculating GDP. But we all know governments don’t create wealth. They only steal and destroy it. He says a more honest measure of GDP would exclude government spending from economic output. Government spending makes up more than 50% of Italy’s GDP. If you counted this as negative, Italy’s government would appear hopelessly insolvent. I don’t see how it’s possible for the Italian government to extract enough in taxes from the productive part of the economy—which has been stagnant for over 15 years—to ever pay back what it’s borrowed. Italian government bonds are trading near record-low yields. More than $1 trillion worth of Italian bonds actually have negative yields. If you owned one of these bonds, you would actually have to pay to lend Italy’s government money. That’s not how the bond market is supposed to work. Given the huge risks associated with Italy’s bankrupt government, the yields on Italian government bonds should be trading near record highs, not record lows. It’s a bizarre and perverse situation. It’s inevitable that the Italian government bond bubble will burst and soon. But the European Central Bank can put off the day of reckoning temporarily buy buying billions of dollars' worth of Italian debt. Shorting is when you bet against an asset. If the asset loses value, you make money. Italian government bonds are, without a doubt, in super-bubble territory. It won’t be long before a pin pricks it and… pop. You, too, can flip Italy’s debt crisis into profits by signing up for Crisis Investing today. We’ll even give you a full 120 days to decide if the service is right for you. Click here to get started. The euro just hit a 13-year low. Today’s chart shows the exchange rate between the euro and the U.S. dollar. When this ratio is rising, it means the euro is strengthening against the dollar. 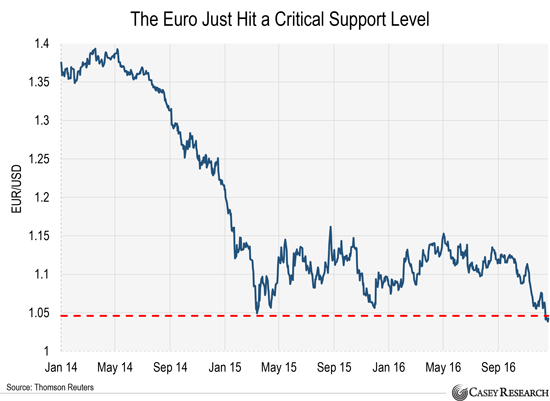 When it's falling, it means the euro is weakening against the dollar. You can see the euro started plunging against the U.S. dollar in early 2014. It then traded sideways for over a year before it started falling again. If it breaks below its March 2015 low of $1.046, it would pave the way for it to test parity with the US dollar (which hasn't happened since late 2002). If that happens, look out below. You see, Nick recommended shorting the euro in the August issue of Crisis Investing. In just four months, his readers are already up 18%. But they could see much bigger gains if the euro keeps falling like Nick expects.